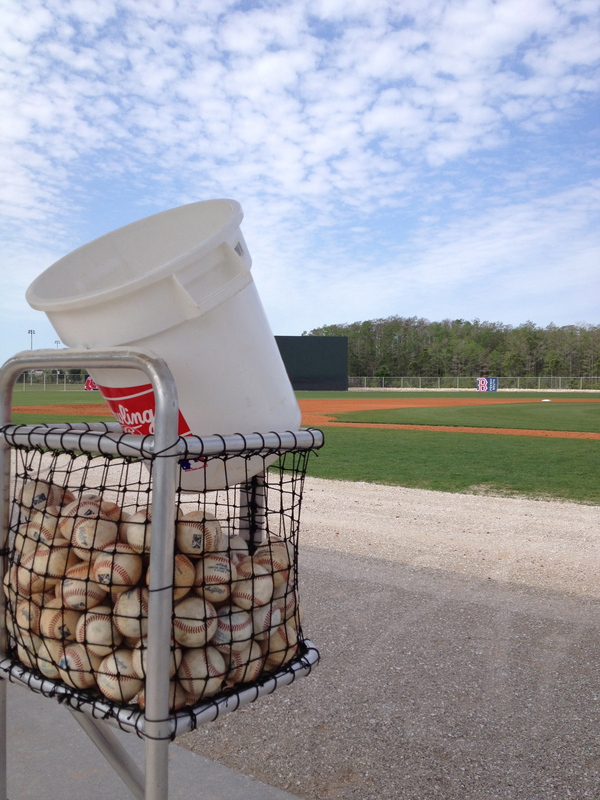 FORT MYERS, FLA. — The back fields of a spring training complex, where minor leaguers drill and compete daily, generally fit together like the petals of a four-leaf clover. The first-base line of one parallels the third-base line of another. And so on, and so forth. Their layout can expose fans, and even players, to occasional risk. It’s not uncommon as games unfold side by side to hear random cries of, “Heads up!” Fair warning about foul balls incoming from neighboring diamonds. But the set-up is both intimate and unrestrictive, affording a close-up view yet allowing for freedom of movement and choice. You’re always at liberty to wander back and forth, between bleachers and backstops; from this game here to that one there. As a Red Sox fan at Fenway South, for example, you can watch Allen Webster pitch in the Triple-A contest on Eddie Popowski Field, before panning left to Lou Gorman Field for Xander Bogaerts’s next at-bat in the Double-A affair. Two games, sometimes more, are there at once for your viewing pleasure; no remote necessary. All while enjoying the open air and, in these settings, an open invitation to strike up a conversation with the stranger beside you. In my short time in Southwest Florida last week, I met a lot of interesting people, hanging out in the eye of nearly non-stop baseball activities. From morning fundamentals to afternoon ballgames. 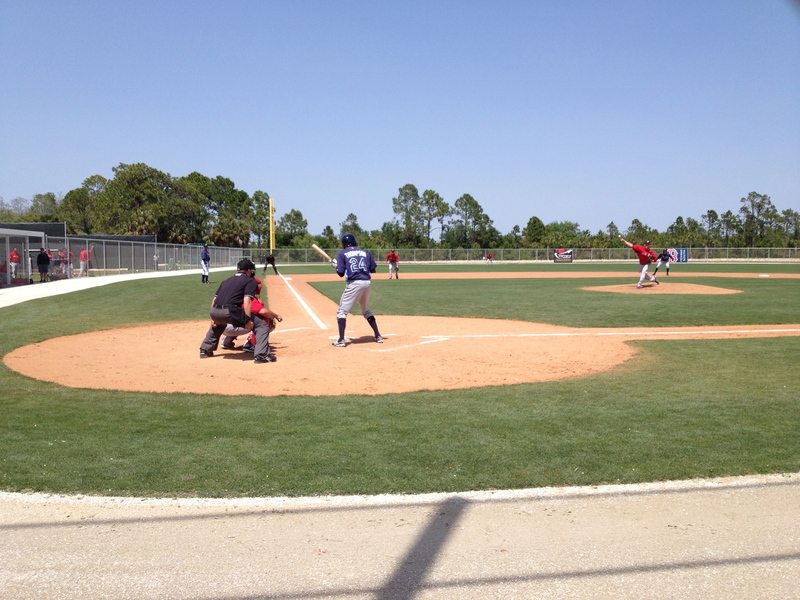 Most of my time was in Fort Myers, where the Sox and Minnesota Twins train. One of my days, at least the better part of it, was spent in Charlotte, spring home of the Tampa Bay Rays. Sitting and standing, in shade and sun, amidst these fields of any fan’s dreams, I was privy to sights and sounds of the sport one can only absorb in-game in spring training. This Thursday I’ll take my usual seat in a radio booth, set back from home plate. Before I do, I’d love to share some of what I observed the last five days, within a few feet — if not a few inches — of the action. 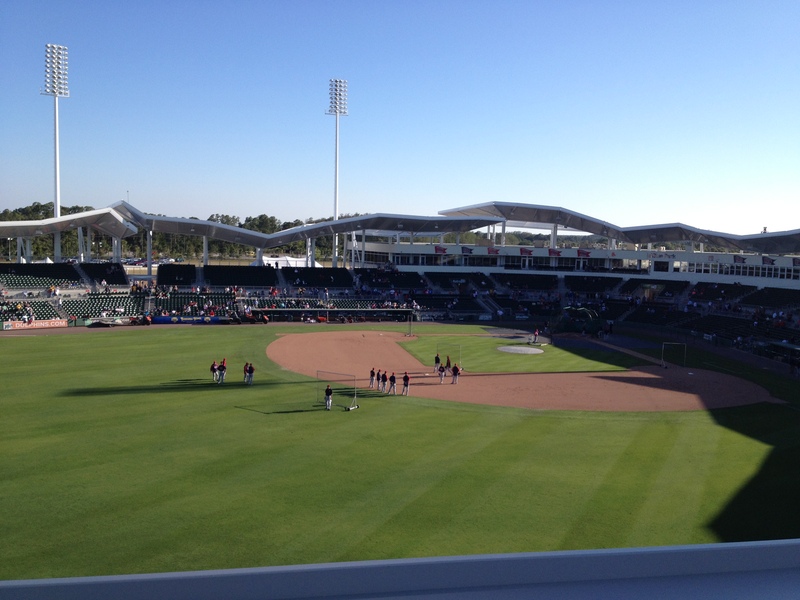 Measuring distance, as many of us are wont to do, by minutes rather than miles, it takes about three-quarters of an hour to drive from JetBlue Park at Fenway South north to the Charlotte Sports Park. Aesthetically, the best way to gauge the distance between them is in light years. One, in just its second spring, is state of the art. It’s hard to imagine what wasn’t imagined by its designers. Facilities are first-rate, the landscape lush. Fan amenities, even on the backfields, where all customers are non-paying, extend beyond comfort to healthcare. Forget to slather on sun block? No worries. Dispensers discharging lotion greet you at the complex’s gate. If you want to avoid the sun altogether, bleachers are protected by coverings. Covered batting cages, with fields in the background at Fenway South. At Charlotte, you find only the bare essentials to play ball. A walkway between twin rows of palm trees leads to an observation tower overlooking the complex’s circle of diamonds. There are picnic tables scattered about, giving visiting players somewhere to woof down their pre-game lunch. The small sets of bleachers behind the backstops of Fields 1 and 2, where Pawtucket and Portland were playing their Rays counterparts, were completely unshaded. The setting is relatively spartan. For Tampa Bay, it seems, it’s all about player development — which the Rays do as well as anyone — not fan enjoyment. Then, on Friday afternoon, there weren’t many fans to write of. A handful of autograph seekers and a few die-hards joined some players’ family members. And, not to exclude your present company, one of the Pawtucket radio guys. But in one sense, less of everything (and everyone) else made for more. Access was nearly unlimited. For most of the game, I leaned up against the chain-link fencing of the backstop. I peppered a reserve charting pitches with questions, and eavesdropped on banter instigated by bench jockeys. I laughed when they laughed. Like when Pawtucket’s Drew Sutton, strolling from the on-deck area on the third-base side of home plate to the left-hander’s box, was targeted by an anonymous Durham Bull in the first-base dugout. “He’s gonna bunt!,” the Durham player yelled out, razzing Sutton more than warning the infielders. And when PawSox shortstop Jonathan Diaz made a diving stop of a grounder and got the out at first, despite a close call, I chuckled at the give and take between the Bulls and a man in blue. Some of the Durham players gave the umpire flak for his call. In turn, he gave them a warning. Sort of. “That’s enough!” the ump declared, trying to sound serious, but unable to suppress his smile. 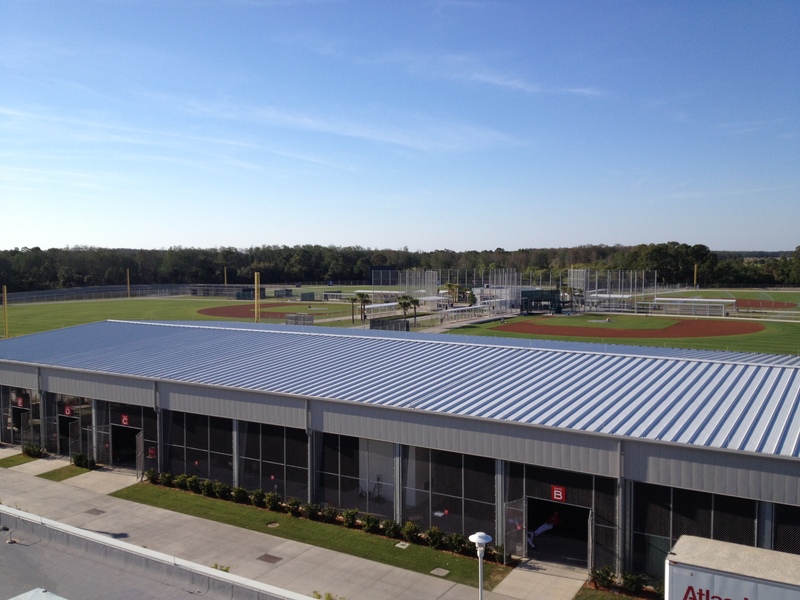 Triple-A (left) and Double-A games go on at the Charlotte Sports Park. Among the most important relationships in sports is that which exists between a catcher and the umpire calling balls and strikes. The former is always seeking the benefit of any doubt for his pitcher. The latter appreciates it when his job is made easier. He prefers the catcher who stays still, offering an unobstructed view of each pitch. Unless that pitch is wild. Then the interest is strictly self preservation; the umpire wants a catcher to block balls in the dirt. They’re reliant on each other, like no other athlete and official. Mainly because they feel each other’s pain, particularly from foul tips. If one clips the catcher, the umpire immediately starts to stall. He slowly switches game balls and deliberately goes about dusting off home plate. Anything to allow a little extra time for an ailing catcher. Conversely, as demonstrated in the video below, the catcher knows enough to reciprocate when a foul ball bypasses him for the umpire. In this case, Pawtucket’s Dan Butler heads to the mound as soon as the arbiter absorbs a blow. His trip triggers a chain reaction: a ‘ball boy,’ trainer and the other umpires all show concern. As does Durham’s Tim Beckham, before digging in to resume his at-bat. Forgive me if I fall into the trap of waxing poetic. I can’t help myself sometimes, especially when I see a lot of what I saw at Fenway South: parents and children sharing the ballpark experience. Especially if a kid wears the colors of his favorite team, the number of his favorite player and the glove made for his favorite position. Several days in a row last week, I encountered the same father and son. Dad was a very friendly gentleman, also named Bob. His boy was a well-mannered Little Leaguer, carrying his catcher’s mitt, outfitted in a Jason Varitek jersey and on a mission to get Ryan Lavarnway’s autograph. On Thursday, I ran into them, as the PawSox entertained the Rochester Red Wings. It was a coincidence whose irony wasn’t lost on either of us. In 1981, the Sox and Wings staged the longest game in pro baseball history. 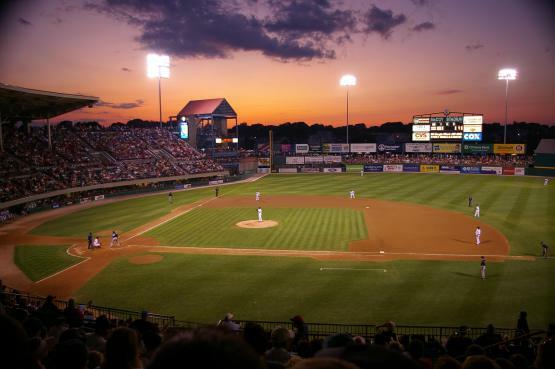 They started at McCoy Stadium in April , before play was suspended, and 33 innings later, ended in June. This Bob has only read and heard about that epic. That Bob saw it end, and has the by-line to prove it. Adding to the already existing irony, Minzesheimer now has family in Pawtucket. For the record, Thursday’s game thankfully did not go extra innings. 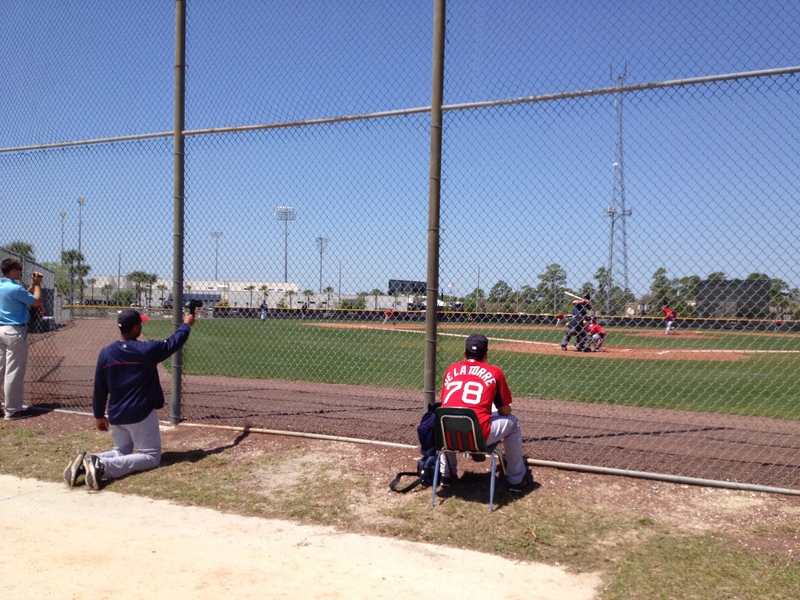 John Lackey pitched for the PawSox Tuesday on the back fields of Fenway South. Here on out, as the cliche goes, we’ll take ‘em one game at a time — except when rain forces a doubleheader, of course — from April through August. No longer, as sometimes occurs on the back fields of March, will innings be stopped due to pitch counts. Starting Thursday at Scranton-Wilkes Barre, results bear real implications on the standings; rallies are allowed to continue. There’s much I’ll miss from my initial visit to Fenway South. But there’s so much more to look forward to, here in the Norheast, starting with Opening Day. PawSox Pedro Beato and Jose De La Torre fix their eyes, and radar gun, on Rubby De La Rosa. CHARLOTTE, FLA. — Following an inauspicious start to his final spring training appearance of 2013, highly-regarded Red Sox right-hander Rubby De La Rosa recovered impressively, completing 2.0 innings for Pawtucket against Durham at the Charlotte Sports Park. De La Rosa was victimized by an unearned run, though it was of his own doing. He walked Bulls’ leadoff hitter Jason Bourgeois, before uncorking an errant pickoff throw to first. Two batters later, Mike Fontenot delivered a sacrifice fly. But De La Rosa concluded his 18-pitch inning with a strikeout of Will Myers, who was caught looking. 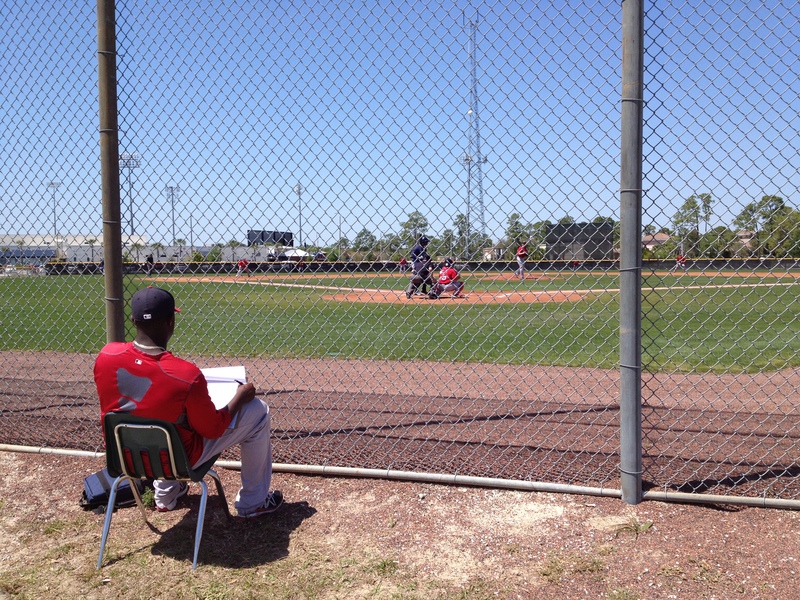 De La Rosa worked the middle innings with pencil and pitching chart in hand. In the second, he retired the side in order, including a punch-out of Shelley Duncan, a right-handed slugger frozen by a knee-buckling slider. De La Rosa closed the inning opposite Chris Gimenez, reaching 97 m.p.h. with his fastball and inducing a weak groundout to third. Acquired in last summer’s blockbuster trade with the Dodgers, involving Josh Beckett, Carl Craword and Adrian Gonzalez, De La Rosa is expected to open the coming campaign in the PawSox starting rotation. He appeared in just seven games at four levels for Los Angeles a year ago, while returning from Tommy John elbow surgery on Aug. 9, 2011. The Twins take batting practice before Thursday’s game at JetBlue Park. FORT MYERS, FLA. –– Meeting with the media this afternoon in the JetBlue Park interview room, Red Sox manager John Farrell once again — if not once and for all — fielded a series of questions about the club’s 22-year-old outfield sensation, Jackie Bradley Jr. With the final two roster spots still undetermined, several hours before Boston entertained the Minnesota Twins, Farrell discussed the factors involved in evaluating Bradley and determining the short-term future of a youngster seemingly poised for a long, prosperous major league career. 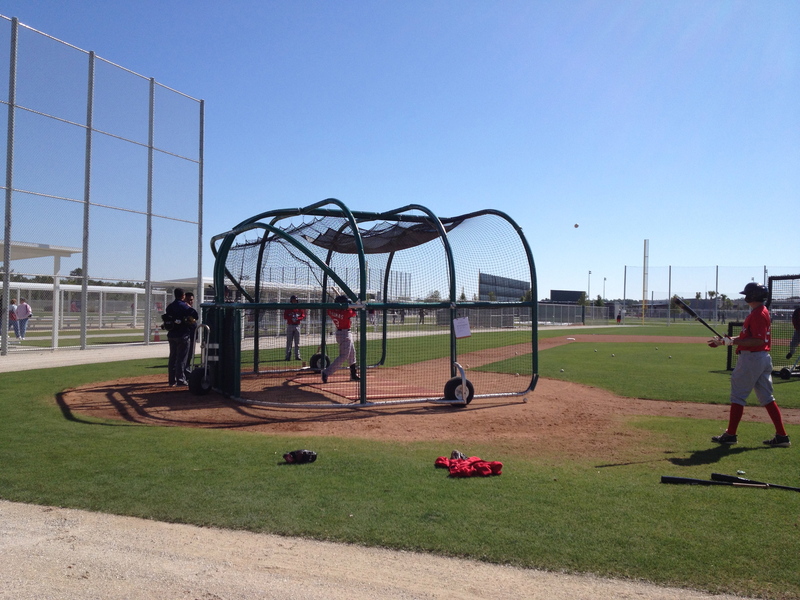 The PawSox take batting practice Tuesday at Felix Maldonado Field, part of Fenway South. FORT MYERS, FLA. — Everyone else adjourned for a meal break late Tuesday morning, leaving Gary DiSarcina to stay behind. Infield and batting practice had just ended, according players and coaches an hour before reconvening at noon to ready for a 1 p.m. game against the Tampa Bay Rays’ Triple-A squad. For DiSarcina, however, lunch was on hold, because he was being held up by a pair of reporters. Standing along the first base line, in foul territory of Felix Maldonado Field, the first-year manager of the Pawtucket Red Sox thoughtfully answered their questions. One of which allowed him to describe the very trait DiSarcina was demonstrating as he spoke. It concerned the three-year period between his last and next managerial stints for the Sox. After the former, with Lowell of the New York-Penn League from 2007-09, he served two seasons as Boston’s minor league infield coordinator. DiSarcina then assumed a similar role for the Los Angeles Angels, before being promoted within the front office. For a brief, yet impactful period last offseason, he was special assistant to the Halos’ general manager, Jerry Dipoto. Out of uniform, DiSarcina was on the inside, attending high-level meetings; sometimes including owner Arte Marino. That experience enriched a virtue that should serve him well, now that he’s back in double knits, back in the Sox organization and back in the dugout. 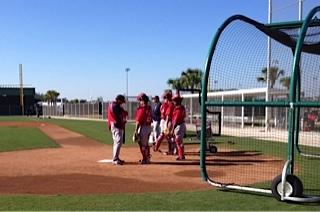 PawSox manager Gary DiSarcina (left) with catchers before beginning a drill on Wednesday. “It’s allowed me to have broader view of a player,” DiSarcina explained. “Sometimes when you’re managing, you want everyone to be like you were when you were a player. If you’re hard nosed, (you want them to be) hard nosed. If you’re laid back, (you want them to be) laid back. The last couple of years have really given me a chance to step back and see that it takes 25 individuals to pull together as a team, and come together as a team. You can’t make everyone be the same. Especially going from boys to men; from the short-season Spinners at pro baseball’s entry level to the longer-tenured PawSox on the top step of the minors. “This level is a little bit different,” DiSarcina continued. “You know, these guys have families, they’re older, they’ve been through the grind, they’ve been in other organizations. And they’ll call you out in a heartbeat if you don’t have a good answer for them (when) they say, ‘Well, why are we doing this?’ At the lower level, they’re just happy to be there. But to Jon Hee, it’s not something DiSarcina went without while in Lowell. Hee was a professional rookie in 2008, drafted out of the University of Hawaii in the 21st round and dispatched to the Merrimack Valley. A 22-year old, sent 5,800-plus miles from home, Hee batted just .196 that first season. “That was a real eye-opener. It teaches you to grow up real fast. You’re on your own (and) you’ve really got to take care of yourself. Everyone is thrown into the same situation. Hee, exhibiting his own forbearance by remaining on a back field of Fenway South, following a three-hit performance in Tuesday’s contest, was then asked if he considered DiSarcina patient as far back as five years ago. “Oh yeah,” Hee replied, adding a laugh as if to say, no question. A few days after defeating the Kansas City Royals on Aug. 6, 2008, Tim Wakefield went on the disabled list due to a stiff right shoulder. He didn’t make his next start, a victory over the Yankees, until the 26th of that month. In the interim, Boston started another knuckleballer, the longtime PawSox right-hander Charlie Zink. Zink, who would win 14 games for Pawtucket that summer, appeared on Aug. 12, opposite the Rangers. A no-decision in a 19-17 slugfest won by Boston, it proved his lone major league outing. A rare idle moment on the back fields of Fenway South. Brief as it was, Zink’s appearance made for a modern-day rarity, with two knuckleballers starting for the same team in the same season. Granted, the ’08 Sox had only half as many as the 1945 Washington Senators, who forced catcher Rick Ferrell to handle a knuckle-balling foursome. That fact alone merited his 1984 enshrinement in the Hall of Fame. This season in Pawtucket, it’s possible that Ryan Lavarnway and catching company will be asked to receive not one, but two knuckleball battery mates. There’s Steven Wright, who was acquired from the Indians last season and has enjoyed a strong spring training. And there’s Charlie Haeger, who started Wednesday’s Triple-A matchup of the PawSox and Rochester Red Wings at the Twins complex in Fort Myers. In 2006, not long after leaving pro ball as a conventional pitcher, only to return armed with the knuckle ball, Haeger was a 14-game winner for Charlotte. Reflective of the pitch’s fickle nature, Haeger dropped 16 decisions the following season, before rebounding to total 21 victories the next two years. He eventually logged 34 major league appearances, including 10 starts, with the White Sox, Padres and Dodgers. Haeger first signed with the Red Sox in July 2011, after being released by the Mariners, and went 4-1 (3.24) in eight starts for Double-A Portland. He was later let go, underwent Tommy John reconstructive elbow surgery and signed again as a free agent in January. While Haeger allowed home runs by Wilkin Ramirez and Clete Thomas in Wednesday’s 8-1 loss for the PawSox, there were still moments when the mysterious movement on his pitches elicited reactions from a group of Twins’ minor leaguers watching from behind home plate. On Monday, I wrote of the radio waves — Sweet Caroline followed by James Taylor — eerily emanating from the car stereo immediately after arriving in Southwest Florida from New England. Tuesday morning, the first songs I heard on 94.5 The Arrow — obviously formatted by a Bostonian — were by the band Boston and a Boston band, Aerosmith. Worried about others in town to see the Twins, I wondered if any of the local stations programmed their playlists to feature musical Minnesotans. Then it dawned on me: Garrison Keillor was only a few frequencies away on NPR. Some of the scenes captured the last two days in Fort Myers (more to come later). Games go on, side by side, at Fenway South. A day of rest for JetBlue Park on Tuesday. Inside Hammond Stadium, spring training home of the Twins. Another view of Fenway South. By the time the wheels touched down for a late-afternoon arrival at Southwest Florida International Airport, the Red Sox and Orioles were well underway an hour and a half to the north in Sarasota. The same was true for the Twins and Cardinals, around the corner at Hammond Stadium. Meanwhile, roughly five miles from them, on Daniels Parkway, JetBlue Park sat idle. Even fields behind Fenway South were relatively quiet, what with the PawSox following their parent club up the highway to engage Baltimore’s affiliate, the Norfolk Tides. With no baseball to watch — unless one were to count the Dodgers-Royals airing later Monday night on MLB Network — the first-time visitor to these parts elected to explore the lay of the land in his rental. At the turn of the key in the ignition, the first song heard from the car radio was Neil Diamond’s Sweet Caroline. The next, no kidding, was a James Taylor number. The original Fenway’s eighth-inning anthem, followed by Massachusetts’ timeless music laureate. Truly remarkable. So totally random. Or was it? However cosmic, or strictly coincidental, that musical double play was a nice welcome for someone just in from New England. From Monday’s Naples Daily News. Turning right out of the airport takes one to Fenway South, spring training home of a franchise that played its first season in 1901. Taking a left will eventually lead past grazing cows, country clubs and stucco shopping plazas to Florida Gulf Coast University, a school that was founded in 1991. Which means it’s younger than Jackie Bradley Jr.
Bradley, the Boston outfield phenom, enjoyed a great weekend, highlighted by a home run off the Phillies’ Cliff Lee. Playing in Philadelphia, the Eagles were even more phenomenal, and their weekend historically great. They started it by beating Georgetown, becoming only the seventh No. 15 seed to win an NCAA Tournament contest. They ended it by out-running and out-slamming San Diego State, becoming the only No. 15 seed to reach the Sweet 16. This weekend, Florida Gulf Coast will meet Florida (period) in a South Regional semifinal in Arlington, Texas. On Monday, just as Bradley was coming off the bench to single home two runs in Sarasota and a local playlist switched from James Taylor to Taylor Swift, all anybody seemed to be talking about in Fort Myers was the new school on the block. Sitting in a barber’s chair, the visitor from New England in desperate need of a haircut, listened to a stylist who, admittedly, had no interest in the finer points of play. Like, for instance, why occasionally everyone else must stand and watch, while a lucky someone gets to stand and shoot. She couldn’t explain a foul shot, but she knew darn well that “those boys deserve all the attention they’re getting.” Who’s to argue? A few doors away, at P.F. Chang’s, wait staff huddled near early-dinner diners at the bar, talking about the big pep rally on campus at Alico Arena. At the nearby Publix market, a young lady behind the register and an older gentleman bagging groceries broke down the upcoming game against the Gators. He’ll be rooting all the way for FGCU, he said. Until that is, if that is, they keep on winning and wind up playing his Miami Hurricanes. Of course, the Eagles have already beaten the Canes this season. 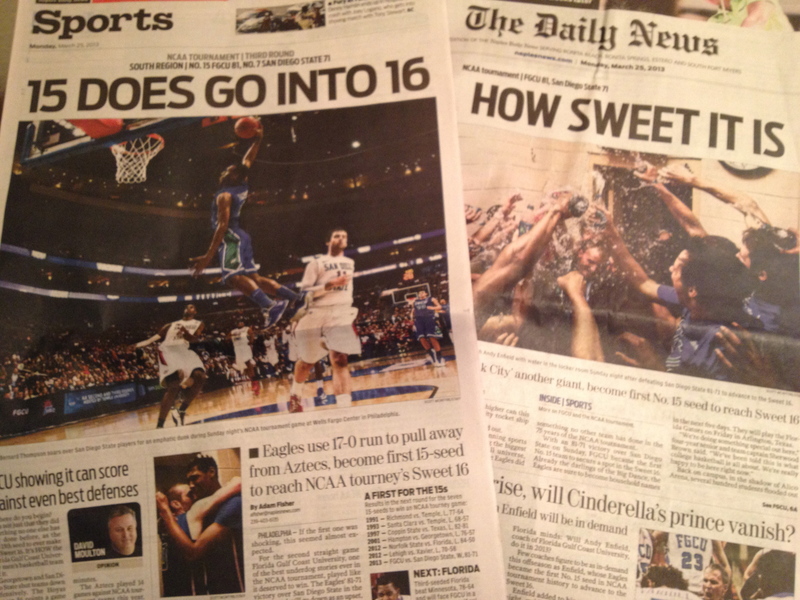 After breaking through to the Sweet 16, the Eagles remain breaking news in Southwest Florida. On those parting words, the customer paid, returned to his rental car and started driving back on Ben Hill Griffin Parkway. Before it became Treeline Avenue, not far from the hotel housing Red Sox and Twins minor leaguers, he observed a steady stream of cars turning off the thoroughfare at an intersection ahead. As he crept to the stoplight, he realized they were all making a right on red into the entrance to Florida! Gulf! Coast! University! Figuring the Dodgers and Royals weren’t on for another hour or two, he followed the crowd. 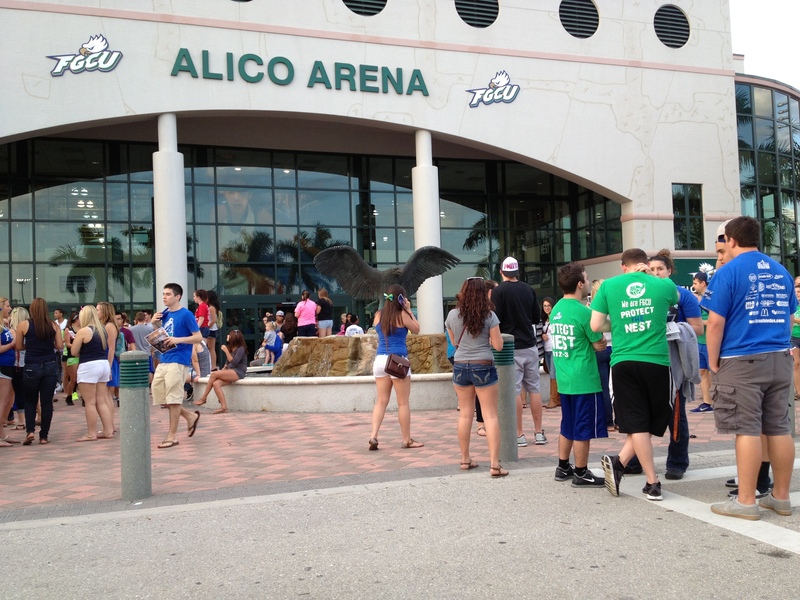 Within minutes, he was alongside Alico Arena. 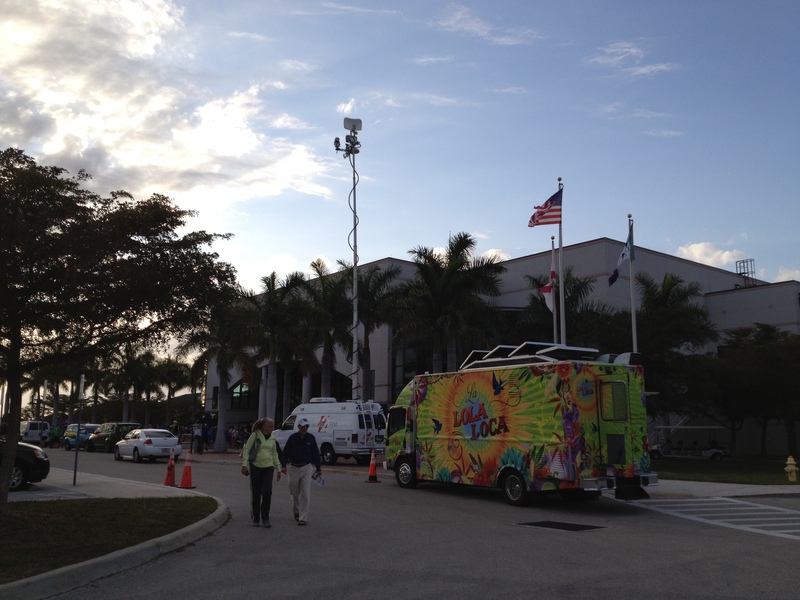 Parked outside were TV satellite trucks, and vans painted with psychedelic designs, broadcasting live. And there were people everywhere, in their aqua colors of blue and green. It wasn’t exactly what the visitor envisioned upon leaving Boston’s Logan Airport late Monday morning. He came here for a close-up look at the Sox; expecting to see crowds this size, but in red and blue, milling around JetBlue Park. 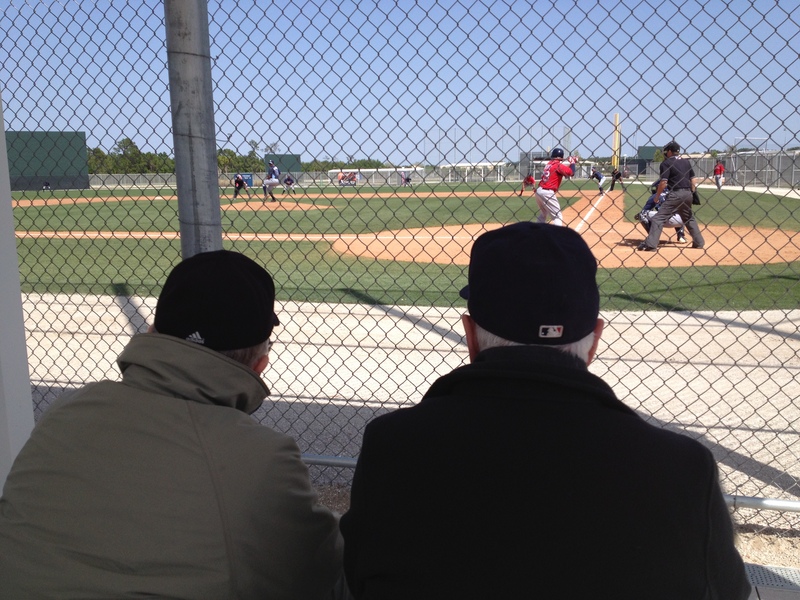 And he looked forward to the quaintness and quietness of spring training exhibitions by the PawSox, on the back fields of Fenway South. But if he couldn’t be there, on this night this was the next best place. He was among fans stirred into a fever pitch by a bunch of kids who are headed to college basketball’s Sweet 16. They’ll be leaving soon for Cowboys Stadium, where they’ll try to Cowboy Up! against the heavily-favored intrastate Gators. Tuesday is a new day. And another matter. Whether or not the locals notice, the PawSox are back in town to host Durham at Fenway South. First pitch is set for 1 p.m.
A couple of years ago, during my annual visit to Pawtucket as a radio broadcaster for the Norfolk Tides, I posed a question to my friend and colleague, Dan Hoard. We were carpooling to and from McCoy Stadium for a four-day series. Home for me, when not following the Tides around the International League, was — and remains — the town of Milton, on Boston’s South Shore. Dan lived on the other side of the city, in Charlestown. I happened to be on his way to the park, and he was kind enough to offer a lift. Which goes to show the kind of guy he is. By then, in late spring of 2011, the voice of the PawSox had already been named the next voice of football’s Cincinnati Bengals. Even on his farewell tour, Dan was the one chauffeuring. Dan spoke of the many people he’d come to know in Pawtucket, and started to recite a few of the most special things that would become memories at summer’s end. Then he paused. “You know, I’m going to miss the sunsets,” Dan said, before describing nature’s nightly phenomenon that illuminates the sky above McCoy’s left-field corner sometime around the middle innings. Until then, despite numerous trips into town since 2006, I hadn’t taken note. In truth, the only time I seemed to notice the setting sun was when it blinded a first baseman trying to track a throw from third base or shortstop. That reality, coupled with the vast foul ground between the bag and the oval-shaped grandstand, could make the Pawtucket experience quite an adventure for the right-corner infielder. Still, I had many other impressions of my own, of evenings at McCoy. All of them favorable. Like the buckets of balls and sleeves of trading cards suspended on strings, lowered from the stands by fans fishing for autographs. The constant reminders of Pawtucket’s place in baseball history, from countless mementos lining the hallways to murals marking every step up the stadium’s ramps. The sounds of the game, under appreciated in most minor-league settings, resonating under the grandstand roof. And bat boys running hard after every foul ball, as if hustling to earn a contract from any of the big-league scouts in attendance. But mine was the point-of-view of someone who took up residence only four games a year in a booth slightly up the third-base line. Dan’s was from the other side of home plate for more than 70 dates, season after season. He enjoyed a much clearer view of celestial nightfalls on Pawtucket. Recent good fortune has caused me to think a lot about that conversation, those sunsets, and how I’ll surely see things differently the next time I’m at McCoy. The PawSox have been kind enough to invite me to join Jeff Levering in the booth Dan Hoard — and a long list of other outstanding broadcasters — once occupied. 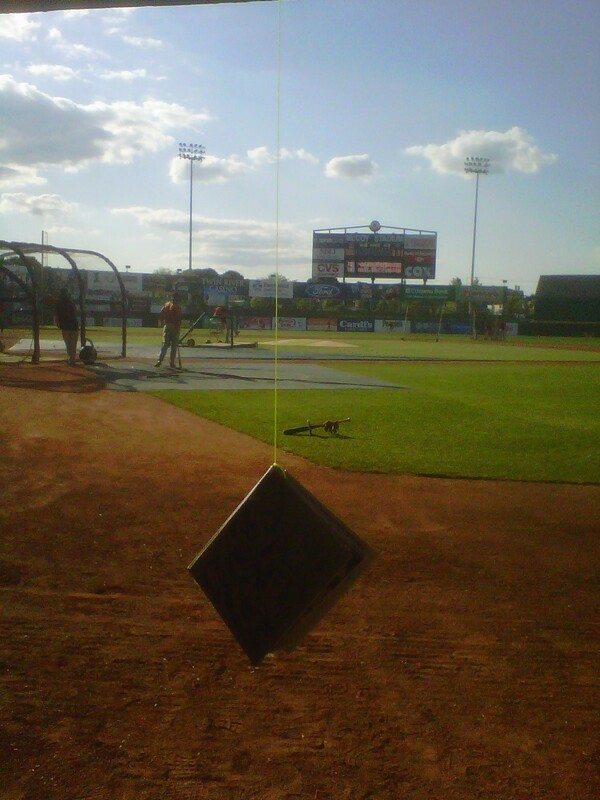 The view from the visitor’s dugout, as someone casts his or her line in search of an autograph, well before game time. Starting April 11, when the Sox host Rochester in their home opener, I’ll be making the familiar commute up and down I-95 the better part of the next five months. Only, instead of riding shotgun, I’ll be driving myself, well aware that many different roads have led me to this exciting opportunity. As a native of Central New York, I’ll admit that my first love in baseball were the anything-but-Amazin’ Mets of the mid-to-late seventies. I was 3 when a family friend returned from a trip to Cooperstown with a miniature Tom Seaver flannel uniform. I wore it almost daily, while memorizing the words to Meet the Mets and being mesmerized by the voice of Bob Murphy. Before judging my early interests too harshly, at least consider that Murph once partnered with Curt Gowdy in Boston, and Tom Terrific wound up ending his career as a Red Sox. Some years later, I discovered a new super station on our cable system; and with it, the BoSox and Bruins. Exposed to entirely too much television as a kid, nonetheless, TV 38 quickly became a favorite. Winter nights were spent with Fred Cusick, John Peirson and Mini 1 on 1 between periods. Sounds of spring and summer included the voices of Ned Martin (Mercy! ), (a pre-Hawkaroo) Hawk Harrelson and Bob (Monty) Montgomery. As for the PawSox, among my earliest memories of the franchise was a mid-eighties night out at Syracuse’s MacArthur Stadium, where Paul Hundhammer and Oil Can Boyd were kind enough to give me their autographs. When I asked The Can to explain his nickname, he uttered something about “drinking a lot of beer.” It took a while, but eventually I figured out what he meant. Not so long thereafter, another PawSox appearance in Upstate New York marked the official start of my broadcasting career. I was a glorified intern for Rochester in 1991, in well over my head, when I was allowed to give the very talented Josh Lewin a three-inning break on the air. The very first play I called was an Opening Day home run off Mike Mussina by Mo Vaughn, leading off the fourth inning. Channeling my best Gowdy, if not Ralph Kiner, I intoned, “Going, going, gone, goodbye!” For the record, I also referred to the hitter as Maurice Vaughn. But like the ball off Mo’s bat, sailing toward deep right-center, I was on my way. You might add, with nowhere to go, but up. Five years later, I found my way to the U.S. Naval Academy, to broadcast basketball and football. I still enjoy the privilege of calling the latter for the Midshipmen. And for the last decade and a half, I’ve complemented that role by continuing to talk baseball. Since 2003, I’ve been lucky enough to do it at Triple-A. First, for the Albuquerque Isotopes of the Pacific Coast League; then for the IL’s Tides. All the while, working for great men like John Traub, Dave Rosenfield and Ken Young; the first two as respective general managers, the latter as owner of both clubs. Whichever organization I was with, and wherever I went, I always seemed to be tugged in this direction. Conversations with various ex-PawSox convinced me of what people around the game long suspected: baseball is different — for the better — in Pawtucket…in The Nation. Such affirmation came from players like Frank Castillo, Adam Stern, Cesar Crespo and David Pauley. And from managers and coaches such as Gary Allenson, Ron Johnson and Mike Griffin. I heard a lot about their experiences. Now I get to live many more of my own. Best of all, I’ll do it at home. My wife, an area native educated in Providence, and I moved to New England five years ago. From day one, I felt like it was where I always belonged. It’s where our two kids — each younger than 3 — have already been indoctrinated in family traditions: fall Sundays are spent with the Pats, spring and summer with the Sox. And it’s where, as I’ve more fully realized the last couple of weeks, a large number of friends and neighbors count themselves among the truly faithful; of not just the BoSox, but the PawSox as well. I can’t wait to talk to them — and to you — from McCoy. Of course, the legacy Jeff and I inherit is significant, to say the least. As you know, the soundtracks of past Pawtucket summers were filled by extremely talented individuals. Personally, few in this business have had a greater influence than the guy who helped start the PawSox radio tradition, Gary Cohen. Same goes for another, who did his part to build on it, Dan Hoard. Yet, in the weeks ahead, I look forward to teaming with Jeff, trying to create our own legacy on top of the one that already exists. The only way to do so is by working daily to earn and retain your trust, attempting to match your passion with ours. With respect to my broadcasting style, I prefer substance over schtick. And, unlike today, I generally try to refrain from the first person. A broadcast is about the game; not me. I will, however, ask you to pardon at least one indulgence. Please forgive me should I take a moment, every now and then, to soak in a sunset at McCoy.